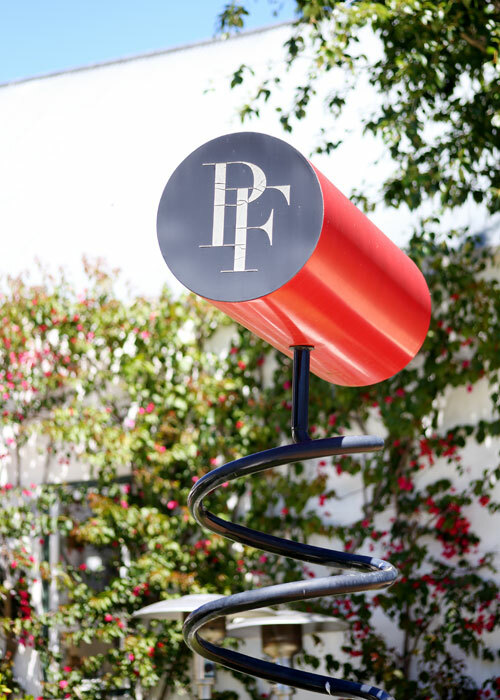 The tasting room at Peter Falke Winery is a deceptive charmer… on the outside a traditional gabled Cape Dutch building, but on the inside an ultra modern space with a slick bar with punchy silver and red accents. 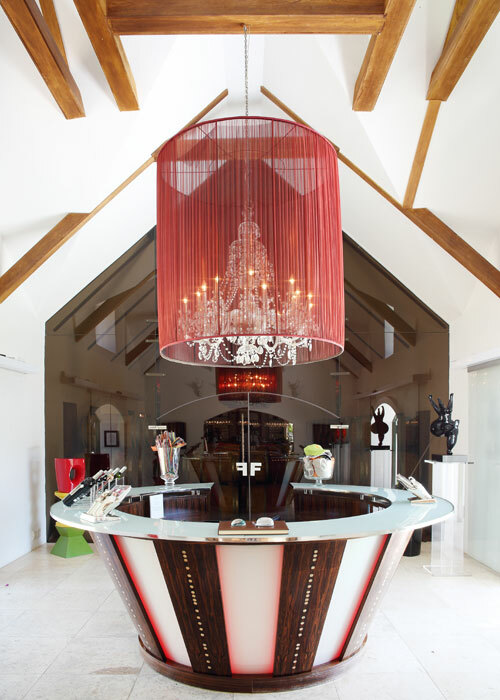 The front entrance is flanked on either side by 2 large, red, contemporary corkscrew artworks – giving visitors a clue as to the juxtaposed character of this boutique winery. Here, olde worlde charm happily fuses with touches of modern flair and what results is a uniquely stylish place to spend an afternoon. German-French couple Peter Falke and Danièle Görtz own the winery. The Falke brand is synonymous with quality sportswear around the world and not only lends its name to the winery, but ensures those same levels of passion and precision go into each bottle of wine produced. 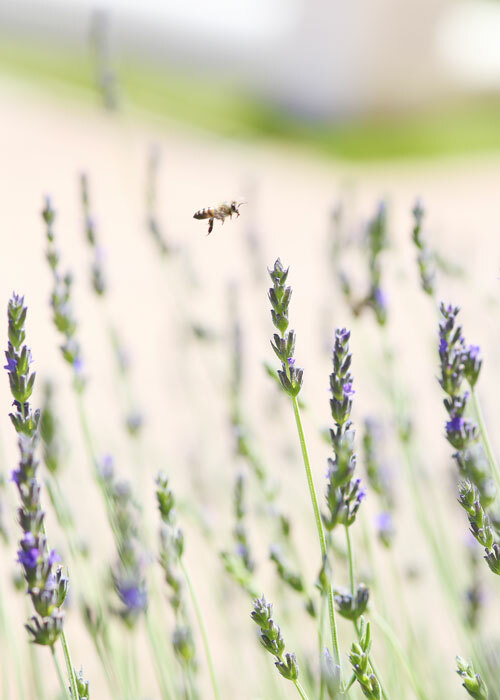 The couple bought the farm in 1995 after falling in love with the buildings and unmatched view over the valley. From there, Danièle, an internationally renowned interior designer, has used sensory elements to transform the space, creating a luxurious and sophisticated ambiance. Pieces of art, furnishings and floral elements give pops of the colour red around the farm and elements of Euro-chic décor give a modern finish. Overall the feeling is refined and fresh, but manages to steer away from pretence. 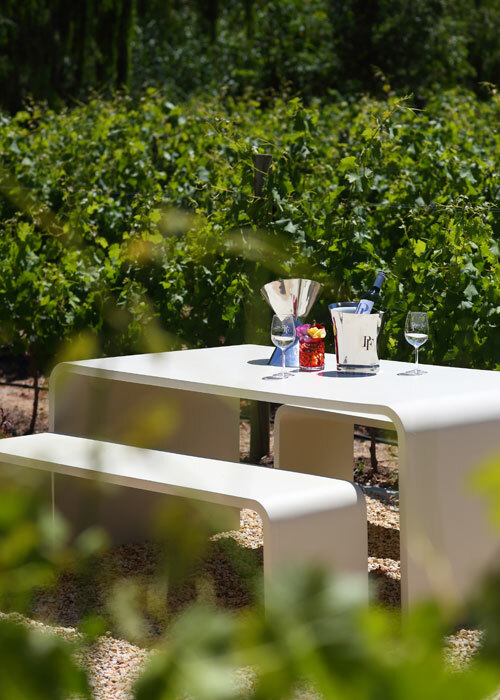 Visitors can be seated in the garden directly outside the tasting room; comfy couches sit under large umbrellas and there is cool shade from surrounding trees. This vantage point overlooks a vast lawn dotted with more tasting tables and bright beanbags – great for sinking into and possibly not getting out of for the rest of the afternoon. On either side are rows of vines, and if you are lucky enough, you can book a table in amongst the vines, for a truly unique tasting experience. In summer you may even happen upon a jazz concert, which are held every so often. 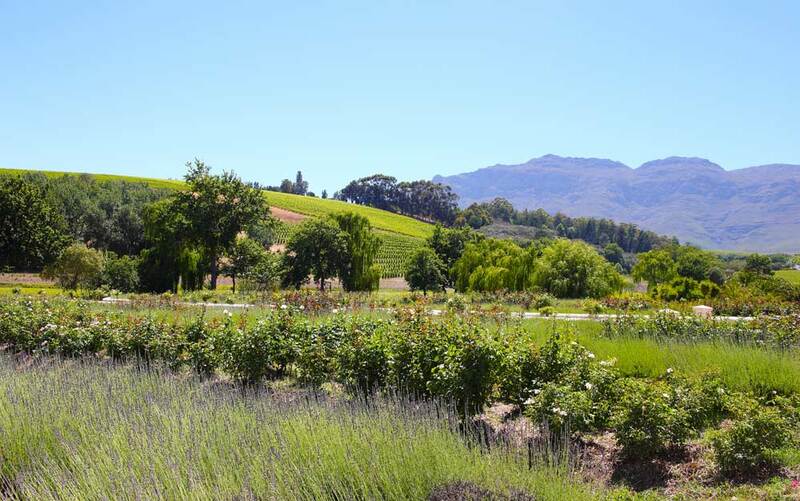 The whole farm is framed by the Helderberg Mountain range in the distance and the view collectively is really quite spectacular. At Peter Falke, it is about quality and not quantity. Each vintage yields small outputs that are lovingly crafted by winemaker Werner Schrenk, along with consulting winemaker Louis Nel. 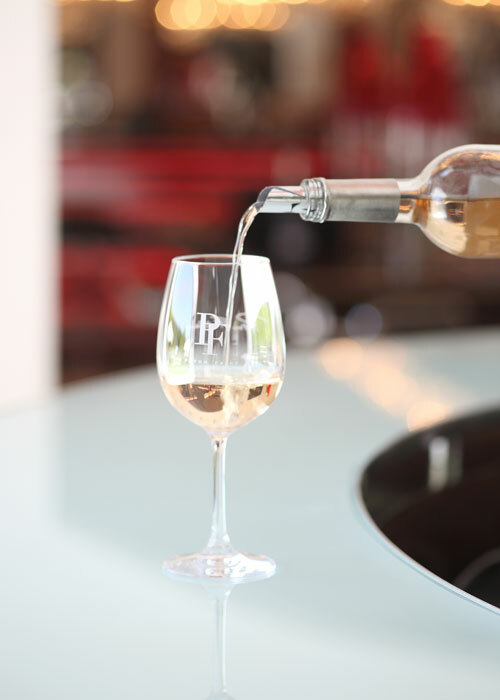 2 ranges of wines are produced, The Signature Range – ultra-premium wines for the discerning palate and the PF Range – wines that are more relaxed and sociable. The signature range includes the Peter Falke Exclusive Blend 2013, Muscat d’ Alexandrie and the 2013 Syrah. The PF range includes the Sauvignon Blanc 2016, Ruby Blend 2013, Pinot Noir 2014, Chardonnay 2015, Cabernet Sauvignon 2013, Blanc de Noir 2016. At the recent 2016 Michelangelo International Wine & Spirit Awards the winemaking team picked up 5 prestigious awards – The Peter Falke Signature Syrah 2013, PF Pinot Noir 2014 and PF Blanc De Noir 2016 were awarded a silver medal. The Peter Falke Exclusive Blend 2013 received a gold medal and then the not-released-yet Peter Falke Exclusive Blend 2014 boasts a platinum medal. All six wines can be sampled and bought at the winery and can be accompanied by a delicious platter of locally sourced cheeses, summer salads, charcuterie and more. Create your own cheese platter with a choices including Gorgonzola, fresh Asiago, Swiss Chevre, White Rock with Cranberries, Gruyere, Huguenot and sheep Pecorino. 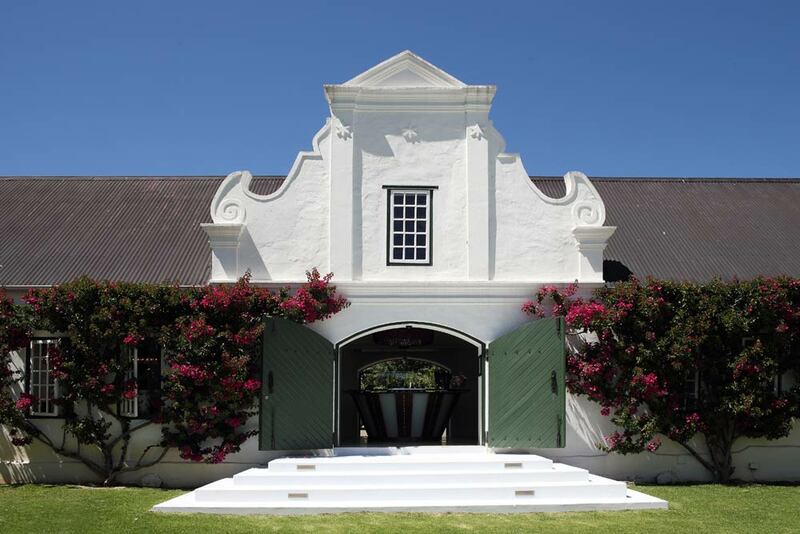 The winery is the last to close its doors of any in the area, offering tastings up until 19h00. 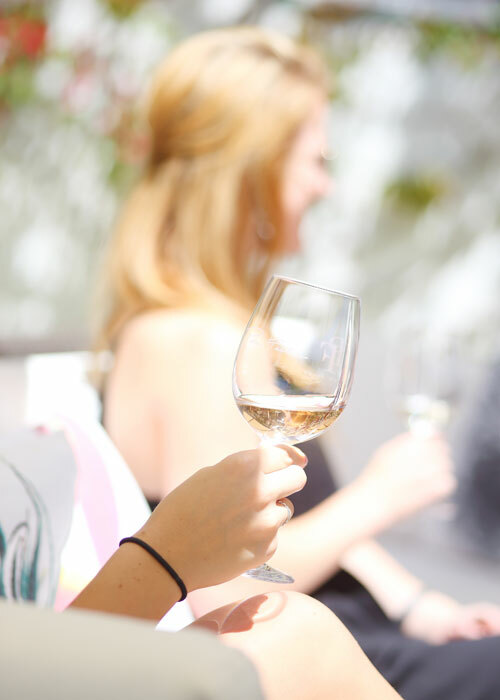 We suggest that you get there a little early to secure yourself a bean bag, lay back, sip on a chilled glass of Blanc de Noir and watch the sun splash the sky with pinks and oranges – this will be a sunset to remember! Open from 11h00-19h00, Tuesday to Sunday. Bookings for groups of 10 or more is essential. For bookings please e-mail; tasting@peterfalkewines.co.za or call 021 881 3677. Groenvlei Farm, Annandale Road Stellenbosch.